When I decided to move to Victoria to finish my undergraduate degree at the University of Victoria, I was told by a longtime friend to look into the Victoria Hillel House as a place to live. At first, I was cautious because I had not been very active at the Hillel of my last university. Following that friend’s advice has turned out to be one of the most transformative experiences I have ever had. Living at the Hillel House has given me so many opportunities to be a part of the Jewish community, which has irrevocably changed my sense of Jewish identity. Within the first week of moving to Victoria as a transfer student, I was asked by the Hillel director to volunteer at a lot of community events. There were two things that struck me deeply and had me admiring the local Jewish community. The first was how small it was and, therefore, how everything within it was such a labor of love. The second was how much older most people at community events were and how much they wanted young people to become involved. Even though I grew up in a relatively small Jewish community in Calgary, the question of whether or not young people would commit and engage in the Jewish community did not seem nearly as urgent as it does in Victoria. Victoria Jewry is made up of mostly older people who have dedicated their lives to the community and are looking for people to carry the torch. My ability to get involved with the kehilah is in part because I am a resident of the Victoria Hillel House. Living in the Hillel House has provided me a space to engage with my Jewish identity in a holistic way, to explore its many facets and intricacies. The space created is based on values like hospitality, generosity, tikkun olam, as well as inclusive and compassionate listening. I can ask questions about the intersections of feminism and Judaism in my life, and how social justice could be directly informed by my Jewish identity. 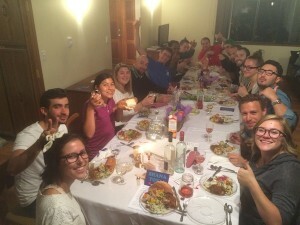 It is a place where I have explored pertinent questions relating to my Jewish identity with other young Jews, been surrounded by Jewish culture, met members of the Jewish community outside of the university, as well as faculty, and done that all within the Jewish tradition of sitting down to a nice meal. Hillel House has been a place for me to feel a sense of pride in my identity as a person who is part of a greater shared history. It is rare for one to find a place that validates oneself and simultaneously allows for personal growth. The Victoria Hillel House has done just that. It has played an integral part in allowing me to come into my Jewish identity and, for that, I am very grateful. 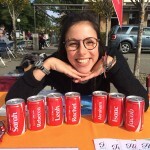 Hannah Faber is a Victoria Hillel House tenant, as well as the volunteer coordinator of the Jewish Students Association and an undergraduate studying theatre at the University of Victoria.